A bunch of proposals amounting to about ₹46,000 crore approved by the Defence Acquisition Council is likely to boost defence cooperation with the U.S. Among the approvals is one for 24 Multi-Role Helicopters with anti-submarine warfare capability for the Indian Navy, expected to cost around $1.8 billion. These are likely to be procured under a government-to-government deal with the U.S. through its Foreign Military Sales programme. 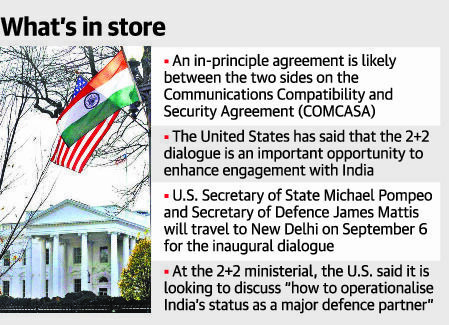 The timing of these decisions is important as they come just before the first 2+2 dialogue between India and the U.S. on September 6, which will see India’s External Affairs and Defence Ministers meeting their American counterparts. It has already signed the General Security Of Military Information Agreement (GSOMIA) and the Logistics Exchange Memorandum of Agreement (LEMOA). The most significant of them is LEMOA, which gives both nations access to each other’s military facilities. But it does not make it automatic or obligatory. The panel directed that the extent of Eco-Sensitive Zones of Western Ghats, which was notified by the Central government earlier, should not be reduced in view of the recent floods in Kerala. The Madhav Gadgil-led Western Ghats Ecology Expert Panel (WGEEP) report had created a political furore in the State with most of the political parties and a section of the church opposing it. The Tribunal Bench, in its order, noted that any alteration in the draft notification of zones may seriously affect the environment, especially in view of recent incidents in Kerala. Former President Pranab Mukherjee shared the stage with Haryana Chief Minister of Haryana for the inauguration of projects under the Smartgram Yojna. The Smartgram Project in Haryana started in July 2016, when Shri Pranab Mukherjee adopted some villages as the serving President and he will be visiting Gurgaon at the invitation of the Government of Haryana on September 2, 2018 to inaugurate projects started during the last two years along with Shri Manohar Lal Khattar, the CM of Haryana. Under the scheme, Pranab Mukherjee had adopted five villages in 2016, when he was President. Now its numbers had swollen to 100. According to Pranab Mukherjee, more villagers must be connected with the “Smartgram” project to ensure peaceful, happy and prosperous villages. Recently, the National Electoral Transformation App (NETA) was launched. It is worth mentioning that this app was launched by former President Pranab Mukherjee. This app is a platform where voters can review and evaluate the functions of their elected representatives, and can also delegate the responsibilities to their duties. This app was developed by the first IT expert Mittal. This app inspired by the US support system allows users to evaluate their legislators and MPs. This app was presented during the bye-elections of February, 2018 in Ajmer and Alwar constituencies of Rajasthan and later it was used in Karnataka in May 2018 before the assembly elections. Recently, the Madhya Pradesh government started a program named "Mil Baanche" i.e. let's read together in all the government schools of the state. This program, launched between state government schools and society, is the first interactive program of its kind. Over 80,000 volunteers expressed the desire to gift gifts to the schools under this program. These gifts include books other than books which can be useful for students. The objective of organizing this program in the state is to make multi-dimensional development of children. There are 820 engineers, 843 doctors, 36 thousand private sector employees, 19 thousand public representatives and around 45 thousand government employees and officers in over 2 lakh volunteers registered for the 'Mill-Bachan Madhya Pradesh' program. A public credit registry is an information repository that collates all loan information of individuals and corporate borrowers. A credit repository helps banks distinguish between a bad and a good borrower and accordingly offer attractive interest rates to good borrowers and higher interest rates to bad borrowers. 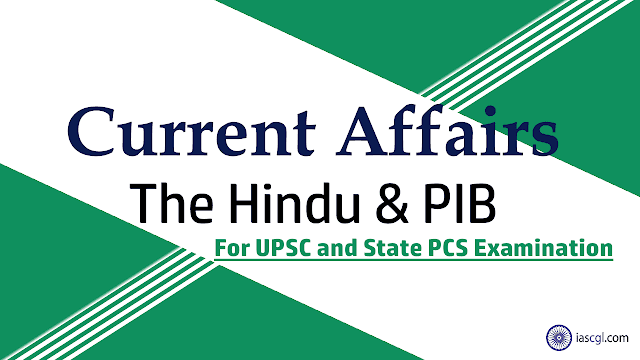 PCR will address issues such as information asymmetry, improve access to credit and strengthen the credit culture among consumers. A PCR may also help raise India’s rank in the global ease of doing business index. Setting up the PCR will help improve India’s rankings in the World Bank’s ease of doing business index. The committee has suggested the registry should capture all loan information and borrowers be able to access their own history. Data is to be made available to stakeholders such as banks, on a need-to-know basis. Data privacy will be protected. Why PCR is necessary ? Credit information is now available across multiple systems in bits and pieces and not in one window. Data on borrowings from banks, non-banking financial companies, corporate bonds or debentures from the market, external commercial borrowings (ECBs), foreign currency convertible bonds(FCCBs), masala bonds, and inter-corporate borrowings are not available in one data repository. PCR will help capture all relevant information about a borrower, across different borrowing products in one place. Regularity in making payments to utilities and trade creditors provides an indication of the credit quality of such customers.